Transition contacts are contacts that go from light to dark in less than a minute, helping your eyes adjust to fluctuating light conditions. Not only do they protect your eyes from harmful blue light they also offer the highest level of UV protection available in contact lenses. When exposed to bright light they darken, and fade back to clear in about 90 seconds when you are no longer in bright light. Transition contacts are continuously adapting from clear to dark and back again, helping your eyes adjust to the changing indoor and outdoor light conditions more effectively than your eyes could do on their own. While these contact lenses are not a replacement for sunglasses since the lenses do not cover the entire eye, they offer something no other contact can, protection, and relief. Transition contacts are contacts that go from light to dark in less than a minute, helping your eyes adjust to fluctuating light conditions. Light sensitivity can be a serious issue for some people. It can cause headaches and even dry or red eyes. Light can even have an impact on your quality of life, making feel you uncomfortable both indoors and outdoors. That’s because exposure to bright daylight, excessive blue light, and headlights at night can temporality disable or disrupt vision, reduce the clarity of distant objects, or make it uncomfortable to see. Because there is such a range of bright light both indoors and outdoors, your eyes are constantly adapting and recovering. Consequently, some people use compensating behaviors to help them cope with bright light including turning off lights, turning screen brightness down, shading their eyes, and squinting. The good news is there is a solution for those who wear prescription glasses. Exposure to bright daylight, excessive blue light, and headlights at night can temporality disable or disrupt our vision, reduce the clarity of distant objects, or make it uncomfortable to see. For anyone who is annoyed by having to push their eyeglasses up the bridge of their nose, or contend with uneven eyeglass frames that are either too heavy or just don’t fit right, wearing contact lenses can be a liberating experience. That’s because they move with your eyes, giving you a full field of vision wherever you look. As a result, they give you the freedom of movement without being held back. Wearing contact lenses means not having to worry about forgetting your glasses or wiping off a foggy lens. When presented with excessive light one tries to compensate by squinting to try and reduce the uncomfortable level of light entering the eye. 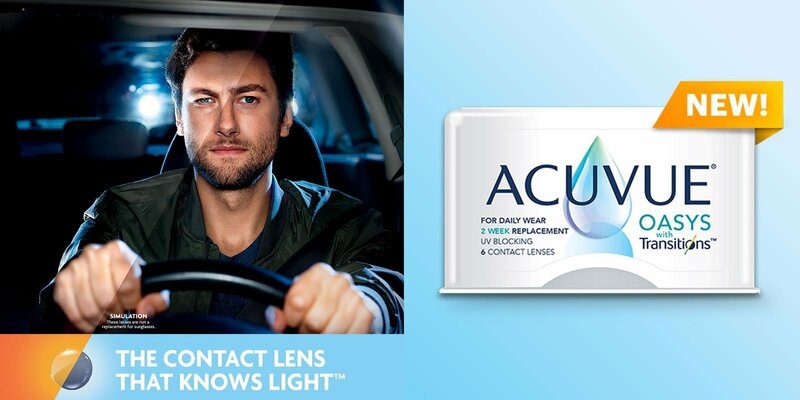 For those who wear eyeglasses or contact lenses when the light gets too bright ACUVUE® OASYS with Transitions™, can filter it. This contact lens knows when you’re indoors, out, or in between. That’s because the lens knows how to change with the light making your vision comfortable no matter where you are. So, whether you are driving at night, going for a bike ride, or working late at the office, Transition Contacts go beyond vision correction by reducing exposure to bright light both indoors and outdoors. For those who are interested in transition contacts the best place to start is booking a contact lens exam. That’s because a routine eye exam is not the same as a contact lens exam. During a contact lens exam, additional tests are needed for a proper contact lens fitting. Contact lenses are a great alternative to wearing eyeglasses. Since contact lenses come in many different designs, as specialists we will create a custom design that offers the best combination of vision, comfort, and eye health. Contact us today at (805) 522-7007 to book a contact lens exam, or to learn more about the types of contacts we carry.